Disclaimer: the following post contains the author’s opinion and may not necessarily reflect the complete views of George Albert Smith. “I would be a friend to the friendless and find joy in ministering to the needs of the poor. I would visit the sick and the afflicted and inspire in them a desire for faith to be healed. I would teach the truth to the understanding and blessing of all mankind. I would seek out the erring and try to win him back to a righteous and a happy life. I would not seek to force people to live up to my ideals but rather love them into doing the thing that is right. I would live with the masses and help solve their problems that their earth life may be happy. I would avoid the publicity of high positions and discourage the flattery of thoughtless friends. I would not knowingly hurt the feelings of any, not even one who may have wronged me, but would seek to do him good and make him my friend. I would overcome the tendency to selfishness and jealousy and rejoice in the success of all the children of my Heavenly Father. I would not be an enemy to any living soul. 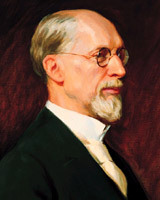 Many who knew George Albert Smith exclaimed that his creed was not just what he believed but the manner in which he lived. When one carefully reads each point they will realize Elder Smith’s understanding of truth and his attitude towards his relationship with God and fellow man far surpasses most of that age. It’s interesting to note that all of those values are selfless. Paradoxically, those few who live this creed (sometimes unaware) are the happiest, fearless, peaceful people on Earth even though they seek little for themselves. The most notable goal Elder Smith brought up, as it pertains to liberty, was his desire to use persuasion rather than force: “I would not seek to force people to live up to my ideals but rather love them into doing the thing that is right.” If parents, teachers, businesses and governments were to follow this simple principle authoritarians would turn to loving parents, disciplinarians to mentors, despots to developers, and tyrants to statesmen. Persuasion rather than force is also more likely to turn offspring to family, student to learner, staff to equals, and serfs to freemen. While those who act in accordance with persuasion instead of force are guiltless of any wrong doing in that particular thing, there is no guarantee that those who are acted upon through loving persuasion will actually repent of their wrong doing. But, as it pertains practically, persuasion has a much higher success rate than force in the long-term. While force might yield temporary results it is the nature of the human spirit to resist force and thus force ultimately fails. On the other hand, when persuasion and truth are paired the results are everlasting. As it pertains morally, persuasion is the only just method of using power and influence that are positive in nature. Force is only justified when it is negative—as an act of defense of last resort. Dear Brother Skousen, I have read with appreciation your pamphlet, “Persuasion vs. Force.” Would that the world and its leaders might follow the philosophies set forth therein. As I read it I thought of the 121 Section of the Doctrine and Covenants verses 39–44. Keep speaking along these lines. It is a message that needs constant repetition. There are a myriad of reasons why people support liberty or freedom of choice. Some are good and some are bad. George Albert Smith taught many important lessons in his creed. One of them being that loving persuasion ought to be used instead of force (D&C 121:39-42). Freedom is an empty vessel. With what freedom we have we should fill it with good things. The more freedom- the greater our capacity to do good. The more good we do- the fuller our joy.